These trees are merely there. We come and we look and we ponder, but they are actually there. I have come across so many wonderful creatures along this very unusual watercourse, and every one has earn’t the right to be there. This is a hard environment to survive in, and those stately trees that manage this, have certainly survived. They even survive us, and we are perhaps the most invasive of all. 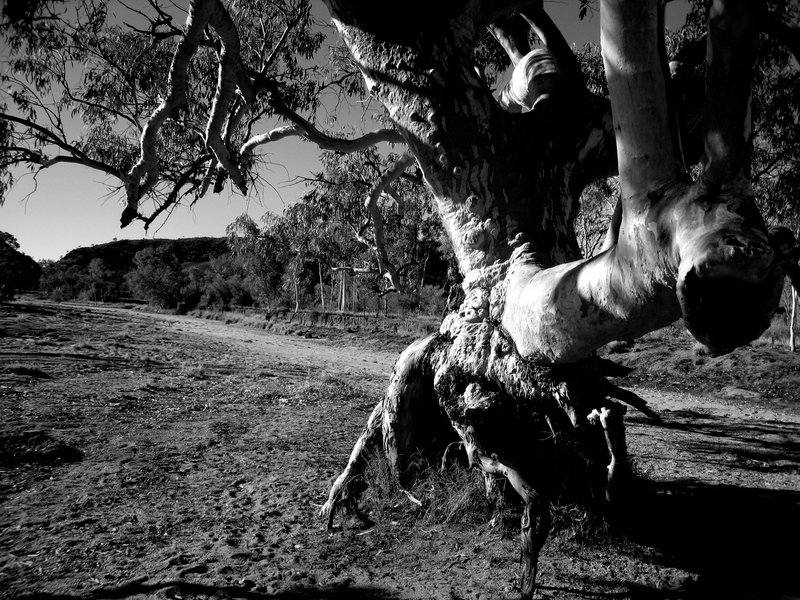 I have watched this particular tree near Emily Gap just out of the Alice for at least five years, and it always manages to instil within me an awe and deep wonder at the stately nature of its being. Thank god for the trees. And when you think of it, the reason these great beings solicit from us such emotion,is because we recognise ourselves embedded within them, and they within us. We have always been linked, and our mytholgies and narratives continually attest and referent to this fact. I was aso thinking about the usage of black and white which in our modern world is almost unheard of. Seems strange that not so many years ago this was the only way to make images and the thinking is that progress is not really that far along as there is still no more clarity in the image. Colour seduces, but does not necessarily make things any clearer. If anything it distracts. What I like about Black and white is that when you come to an image with this dichotomy, it either works or it does not, and there are no props to disguise its merits. Have a look at what shadows do to a burnt out series of trees and watch you don’t get stuck in the mud. The video here is my homage to a particularly beautiful tree just beyond Emily Gap.